Purchase this product now and earn 2,598 Reward Points! 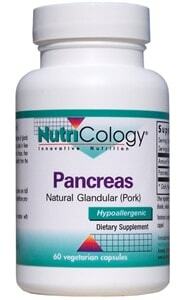 Provides pancreas tissue. Properly prepared pancreas glandular substance contains amylase, protease, and lipase, as well as other digestive factors naturally occurring in the pancreas. Pancreas Natural Glandular products from lamb, pork and beef can be used in a dietary rotation plan by those who are highly sensitive. Our natural glandular material is derived from government-inspected, range-fed animals, raised in New Zealand and Australia, whose animal husbandry regulations are among the strictest in the world. The material is lyophilized, which means it is immediately frozen, then subjected to a high vacuum that vaporizes moisture directly from the solid state. Formulated by Dr. Nicholas Gonzalez M.D. Suggested Use: As a dietary supplement, 1 capsule three times daily taken 1/2 to 1 hour before each meal, or as directed by a healthcare practitioner.